First, thank you for clicking on the link! This December, I'm attempting to summit the highest volcano on earth- Ojos del Salado. There are about 135 million children enrolled in government-funded schools between grade I and V in India. Most of us have had the privilege of studying in high-quality schools and universities and up to an advanced level, and it is time to change ‘most’ to ‘all’ – one step at a time. I’m from India, a developing country, where 96.7% of children (in the age group 6- 14 years) are enrolled in school (so that means 4 million children are still out of school) in rural India (ASER report 2014). 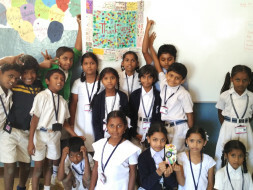 I’m raising funds to help 27 children who are motivated and encouraged to come to school, thanks to the intiative by Teach for India (http://www.teachforindia.org/). All of these children come from an underprivileged background and their parents struggle to make ends meet, let alone trying to provide them with all the amenities to get good education. Although they have a roof to study under, they don’t have a well equiped classroom and sanitation conditions are poor. These are some of the basic but crucial elements to a child’s upbringing and it directly impacts the learning curve of a child. Every child has the right to be educated and must be given an opportunity to realise their dream. We should do everything in our capacity to help foster their dreams. My friend Shilpa Jacob is the head of the family (the teacher). She gives her best every single day to not only help them become academically strong but also instil in them the importance of being a good human being. Being a Kannada (native language spoken in a particular state) medium school it is a challenge to teach them in English , but these little ones are dedicated and determined as some have already started to talk to her in English (wish I could go back to being a kid). All she wants to do at the end of the day is to provide these 27 kids a well-rounded education so they can become the best version of themselves. Right now, the classroom they study in is just a place that brings these childern together. Hence, my primary objective for raising funds is to provide a text rich, furnished classroom, along with a small library which would greatly enhance the learning of the children. 2. Build cleaner and more hygenic toilets (Schools with usable toilets: 65.2%; Schools with usable girls’ toilets 55.7% (2014)). The most important question to ask is: Are the children really learning? So should we stop trying? Again, NO. Improve the factors that affect a child’s learning and try again, which is exactly what I’m trying to do. These kids are hardworking and deserving (every kid is), let’s give them a chance, together! Keep up the good work, buddy!